What is essential in life? How do we live most fully? In his final years, Walt Whitman reflected on his bedrock beliefs and on the experience of a live lived passionately and with sympathy toward others and the universe itself. Speaking to the young journalist and reformer Horace Traubel, who visited him nearly every day at his home in Camden, New Jersey, Whitman offered profound perspectives about fundamental questions, encompassing the spiritual, political, and all that he had learned over seven decades of vigorous living. Traubel’s meticulous transcriptions of these conversations were eventually published in nine volumes. In Whitman Speaks, Brenda has compiled a wide selection of Whitman’s observations that conveys the core of his ethos and the still-pulsing power of his insights. Here is Whitman as sage, visionary, and philosopher, advocate for an expansive and liberating style of being. Here, too, is the poet’s more worldly side–recalling the opprobrium heaped on Leaves of Grass for its candor and sexual frankness; culling vivid memories of Thoreau, Emerson, and Lincoln; venturing literary judgments Shakespeare, Goethe, and Tolstoy; and expressing both disappointment and hope about the nation he loved and the promise it embodies. 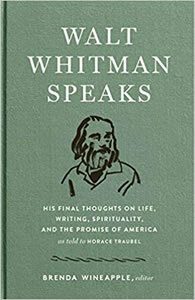 Enriching our understanding of the greatest of American poets, this gathering of Whitman’s late thoughts is a wisdom book for the ages, enduring insights that speak eloquently and indelibly from his time to our own.